http://www.ir.bsu.by/kel/homesergei.htm Talking about the recent BelNATE conference as one example of use of these tools in building communities that in turn pitch in to train other teachers in their use. You need a reliable anchor point and help desk that anyone can reach. I like to use http://www.tappedin.org as an anchor for online events. If you need help you can go to the text chat there (log in as a guest if you aren't a member of Tapped In) and someone will be on hand to assist. . If you have a web cam you can broadcast to us via Yahoo Messenger http://messenger.yahoo.com and we can attempt to keep your cam on our screen as we present from Abu Dhabi. I'm vance_stevens in Yahoo Messenger. You can use either Mac or PC at this site. If you don't have Sun Java you will have to install that as well (for PC; for Mac there is a corresponding requirement). You will be prompted to approve installation of what is required. You might also visit there in advance and install the iVocalize software. This is an easier site for casual visitors than Learning Times and you will see from the presentation a comparison of the two. Thanks very much to all the Webheads who met me and a room full of about 50 participants, science and maths teachers mostly, who had dropped by my presentation to learn more about the tech tools they had little familiarity with. Sergei was first to appear and took on moderator duties when my connection would time out, which happened many times during my demonstration. Michael had appeared 4 hours earlier, at 7:20 Abu Dhabi time (caught me printing handouts in my office) and he did manage to race home from his appointment in the suburbs and join us just in the nick of time. Michael Ivy tried to get in, and Maria Jordano popped by for a few minutes. Sus made an appearance toward the end and enlivened the proceedings at just the right moment. The audience watched the manipulations on the screen up front and asked questions like, what kind of bandwidth do you need for this (Sergei said he was using 33.6k dialup) and how does this apply to our students. I mentioned the work of Webheads helping students communicate with real audiences and suggested an online science fair. If you've found it hard to read that paragraph you can imagine what my on site audience was going through. So I pointed the web cam at the nearest one, Rita it turned out, and got her to say Hi to Sus. We'd already taken a few questions from the audience and handled them online. If the connection had remained stable it would have been a brilliant presentation. Unfortunately we lost the thread at critical junctures, such as Sergei's presentation. It happened to us while James was talking last week as well. We are perhaps pushing the limits of what we can get for free. At any rate I never cease to be amazed at how webheads band together to not only provide these wonderful tools for us to experiment with, but come together to help each other use them. 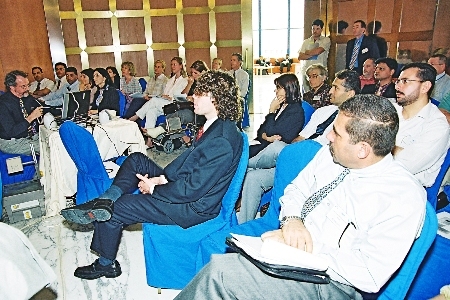 There was a practice session for this presentation at the Officer's Club in Abu Dhabi on April 26 involving numerous online volunteers who assembled on short notice to help me test the connections. We started with Learning Times where Michael in Australia was talking with Candy in San Diego who was connecting from her classroom and broadcasting web cam shots of her moving around a class full of students in a computer lab. Sergei was there as well, and Elder Bob. Eventually I decided to share one of my browser screens and show those present how to log on to Alado. My intent was to simply to show the logon procedure, but knowing I could use the browser window I was using for application share after leaving LT, I simply continued with the process and logged on. iVocalize launched and connected and I found Gianluigi waiting for me at Alado. The interesting thing was that those in LT could see Gianluigi in Alado via the screen share in LT, and they could see me text chatting with him. I decided to talk to Gianluigi although I was still in LT and had not relinquished my ability to talk there, and to my surprise, this worked as well. Gianluigi could hear me, and when I wanted I could go back to LT and talk to the people there. It was interesting and unexpected to know that I could be in both places at once, and let the LT folks see my conversation with Gianluigi via partial screen sharing. 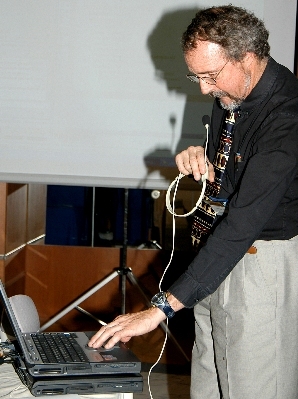 Vance Stevens is a Computing Lecturer at Petroleum Institute in Abu Dhabi, with ESL and CALL experience since the 1970s. He has conducted research, produced numerous publications and CALL software, and served on various editorial boards and committees of professional organizations. He has developed communities of practice for students and teachers based on the 'Webheads' model of online community development.